The article below claims that Russia’s population is currently growing at a slow rate. Russia’s population is actually growing, not shrinking, although its growth is very, very small. While the population was shrinking in the 1990’s and early 2000’s, at the moment it is slowly growing. Despite this, it’s likely that the population will shrink again between now and the next ten or twenty years, as the country’s very smalll growth is completely driven by immigration, not natural growth. 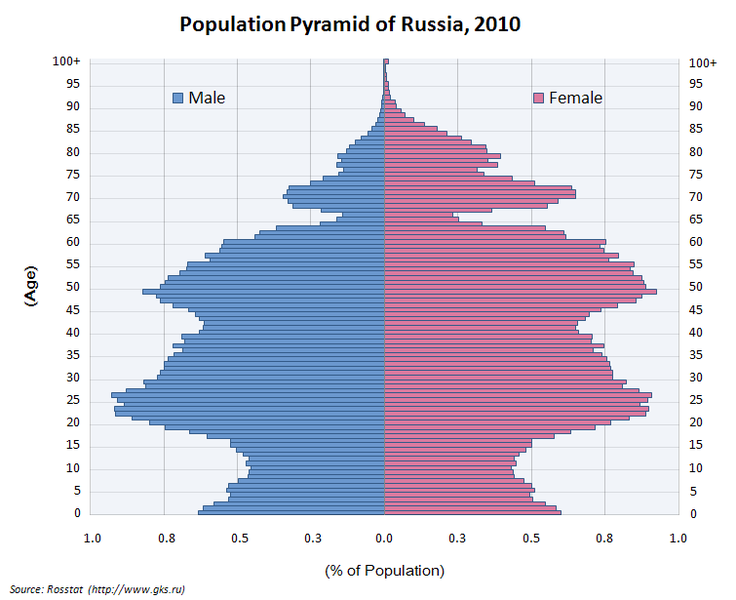 Has the Russian population finally recovered from the disastrous demographic collapse that started in the Soviet era, and continued through the turbulent transition, well into the current neo-imperial phase? Putin says everything is fine, and his media associates in Russia and abroad agree with him. But is it possible for government statistics to mislead, even in Russia where the media speaks with one voice? While Russia’s population began to fall in absolute terms in 1992, the seeds of the decline were planted two decades earlier. In the mid-1960s, when Stalin-era policies to promote childbirth ended, birth rates began to decline and death rates edged up. Indeed, the birth rate today of 12.5 per 1,000 people is less than half the Stalin-era high of 26.9 in 1950. The death rate, at 14.2 per 1,000 people, is also almost double that of 1960, when the figure was 7.4. Krupnov believes the total number of premature deaths that can be attributed to the collapse of the economic system is in the order of 10m-20m people. This compares with the figure of roughly 22m deaths in the second world war. Russia’s depopulation, while more or less a country-wide phenomenon, is not uniform across all Russian territories; there is considerable regional variation within this overall national average. Not all oblasts even experience negative natural increase; in 2006, 20 of Russia’s 89 oblasts reported more births than deaths. These areas tend to be where ethnic and religious minorities are overrepresented. Russia’s ethnic minority population is growing the most rapidly, through both immigration and differential birth rates. Russian populations have been in chaotic flux for decades, and are now poised on the brink of a particularly steep plunge. Putin blew a golden opportunity to diversify his economy, and make conditions better for young Russian men and women to start families. As a result of Putin’s failure, Russia’s brain drain, womb drain, and capital flight continue — and threaten to grow out of control, should oil & gas prices drop for an extended time period. The public health system and health care system in Russia are such that Russia’s epidemics of HIV, TB, Alcoholism, Tobacco abuse, and manifestations of national malaise such as suicide, are only likely to get worse. High rates of abortion combined with high male death rates are blamed for most of the ongoing decline of ethnic Russians. 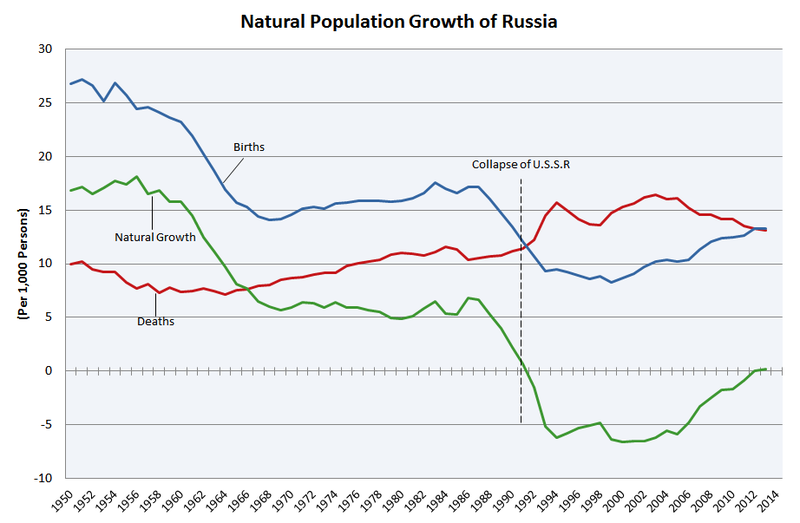 Immigration of non-Russians helps to keep overall population and overall birth rates from collapsing. There is an ongoing problem of large numbers of newborns being abandoned by mothers to a horrific orphanage system, where abuse is widespread. Large numbers of Russian babies are never born. Of those that are born, large numbers are abandoned to orphanages and other places even worse — because the mother cannot care for them. Comparing Russia and the US, we see that heart disease is the most common cause of death in both countries. In statistical terms, Russia suffers from a large number of “excess deaths” compared to the US — 2,356,309, in adjusted population terms. Russia’s situation is precarious on many levels. Will Russian leaders scale back their ambitions, become more risk averse, and more readily cooperate with the international community to compensate for Russia’s decreasing human potential? Or will they decide that drastic measures such as preventive wars and a nuclear weapons buildup are needed to compensate for their lost “mass mobilization” potential against foreign threats? Unfortunately, demographic analysis alone cannot answer this question. Never trust the press releases of a national dictator who controls all the media. One may express the best of intentions, but when one’s actions are counter-productive to the stated goal, words are worse than excrement. At least shite is useful as fertiliser. History tells us that it is possible for entire tribes and ethnicities to disappear, if forces of demographic collapse proceed to the point of no return. This is what seems to be happening in Japan, and a few other relatively advanced nations in East Asia and Europe. Some populations seem to have disappeared from time for no apparent reason. In the case of Russia, it would seem that excess mortality in males (alcohol, suicide, violence, etc) combined with a large-scale anti-natalism among young Russian women, largely accounts for Russia’s demographic meltdown. The ongoing brain drain and womb drain out-migrations do not help, either. This is useful knowledge to keep in mind in the light of Tsar Vlad’s belligerent and potentially apocalyptic campaign to reassemble a grand new Russian empire. Our best assessment is that without alcohol, Russian mortality would still be higher than in western Europe, but much lower than it is currently in Russia. But it is unlikely that Russians could tolerate their current circumstances without abundant quantities of vodka tonic. Update 1 Jan 2015: One of the likely side effects of Russia’s drastic cuts in public health and health care spending is a decreased availability of medical abortions to young women. This will likely lead to many more back-alley abortions, many more abandoned babies, and many more street children who will fall into very bad habits of drugs, alcohol, and crime. These unfortunate newcomers will be counted in Russia’s vital statistics, and celebrated as a victory for the Kremlin. They will also likely accelerate the ongoing decline and fall of mother Russia. This entry was posted in Demographics, Epidemiology, Russia and tagged Russian Collapse. Bookmark the permalink. 11 Responses to Is Russia’s Population Growing? The real question is are the people having babies the people who can maintain the nation? The question is what we are comparing Russia’s demographics to. It seems strange to point to Russia as being in the most dire straits demographically when the next generation of voters in the US will be mostly non-white: http://www.newsmax.com/US/Pew-millennials-voters-minority/2014/03/25/id/561624/ This demographic discontinuity in the US is on a genocidal scale. Russia is not in this bad of a position. Neither is Japan, which has had greater control of its borders than the US or Europe. Matt: Good question. It is a question that societies from Russia to Europe to the entire Anglosphere need to ask. Third world people as a rule are not equipped to maintain a complex infrastructure. Mark: We look at demographic problems of different nations in turn. Readers in general should keep in mind that variants of “tu coq” do not qualify as logical arguments, but rather as attempts to change the subject. Some people look at Russia as some type of “last resort refuge” from the empire of political correctness, affirmative action, and third-worldification of western civilisation. Such a belief qualifies as a delusion. It would be best to pin one’s hopes on things that are more real. This issue goes beyond whether or not “Third world people” can “maintain a complex infrastructure” or not. Just because they or anyone else could would not justify immigration. Basic rationality demands comparison in this instance. Suggesting that Russia is in the most dire straits demographically or among the worst implies that other areas aren’t worse. But that’s not the case, as the example of the US makes clear. The US is in a significantly worse position. Right. So if we convert the assertion “The US (or the west in general) is in a significantly worse (demographic) position than Russia” into a testable hypothesis, we might compare migration levels between the two regions, to determine how the people who live in the respective regions see the matter. In terms of Russian out-migration to the west, we find tens of thousands of political asylum-seekers every year. We find a significant and ongoing Russian Brain Drain We find an ongoing “womb drain” of young fertile Russian women, and so on . . . And old, old story getting worse. In terms of western out-migration into Russia, we find Edward Snowden,… and not much else of note. Thanks for the encouragement. I will expand on this point in a full article. Comparing migration levels between two regions is not a test of demographic position. Africans are flooding into Europe, Europeans are not flocking to Africa. This does not mean that Africans are in a worse demographic position. In fact the opposite is the case. The African population is expanding in Africa and is replacing the European population within Europe. The European population is shrinking and being replaced within Europe. The test of demographic position is to look at demographic composition. The next generation of voters in the US will be mostly non-white: This kind of demographic discontinuity is of a genocidal scale. This is not the case in Russia and thus it’s not in as bad a position. I will also look at multiple public health parameters, crime levels, migration patterns, factors that affect fertility, factors that affect mortality now and into the future, education levels, likely economic trends, corruption, uniformity of law enforcement, etc etc. It is easier to make comparisons between Sweden and Norway, or between North Korea and South Korea, than between Russia and the US, given the large and varied land areas, climates, population mixtures, differences in histories, population densities, and their different geographical neighborhoods. Large nations such as Russia and the US have multiple regions — and regions within regions — each with its own history, traditions, ethnic composition, etc. This makes the analysis a lot more complex. The best way to simplify the comparison that I can see, is to look at reciprocal migration. It is clear that a lot more Russians are emigrating to the US, than Americans emigrating to Russia. These migrants take many of the factors referred to above into account when making their fateful decisions. You seem to be looking at demographics from the standpoint of a single parameter: the ratio of white to non-white residents. I suggest that you disclose your simplification of demographics to that one parameter from the beginning, in any discussion you may have on the topic. I say this because that particular approach to demographics appears to be axiomatic in your case. And it is not generally fruitful to argue axioms in most cases. We at the Al Fin blogs have looked at the many serious problems with multicultural societies for the better part of 10 years now. It is not a neglected topic by any means. But perhaps you haven’t read many articles from the Al Fin Family of Blogs? That would explain much of the apparent confusion. Blog articles are relatively short, and necessarily limited in content. And yet, most blog articles in the Al Fin Family of Blogs have a lot of history behind them. Reciprocal migration is not a test of demographic position in the way you think. The fact that more Russians are emigrating to the US than Americans are to Russia means that Russians are taking territory away from Americans, with territory including not just simple land and real estate value but all economic property value which includes jobs, licenses, government welfare and services, transfer payments, etc. Currently, populations receiving migration such as Europeans and Americans are in a worsening demographic position. Populations exporting population such as African countries are in a strengthening demographic position. I’m not actually simply looking at the ratio of white to non-white residents. If the next generation of voters in the US were mostly white Poles or something, it would still be the case that the American population was experiencing genocidal levels of population replacement and displacement. The fact that it’s non-whites rather than white Poles or something just makes it that much starker. Nothing of this scale is taking place in Russia right now. I understand that that is your point of view. If you check out the hundreds of Al Fin blog articles on the topic of dysgenics in western countries and the problems in multicultural societies, you’ll see that we do not turn a blind spot to those problems. Everyone has blind spots, areas where they limit comparisons to one or a few cherished criteria. It’s part of being human. And people are always bound to disagree on some issues, no matter how far they try to pursue the argument. Let’s agree to disagree, before things get more repetitive than they already have. There is no doubt that Russia is the extreme case of demographic decline and dysfunction, both in numbers and quality of life. Russia’s future is indeed grim, although it might be stabilized. At least they are not under the foot of the Golden Horde. However, All of Europe, plus China, Korea, Japan, Iran and parts of the Middle East (especially Iran) suffer from similar, though less severe, problems. And the white populations of the US, Canada, Australia and New Zealand also suffer from these problems. Immigration (colonization?) from Third World countries into Europe, the US and the rest of the Anglophone might stop the decline in absolute numbers (to be proven), but as pointed out above, these newcomers will not be able to maintain the high tech civilization they are joining. So the immigration policies of the US/EU are ultimately self-defeating. Large numbers of Third World immigrants will also change the culture of the countries they come to, making them more like their Third World homes. Parts of the US are already Mexican in culture, and parts of the EU already live under Sharia Law. In the case of the US, its immigration policy is virulently anti-black, perhaps deliberately so, because the Mexican immigrants are displacing native black Americans both from the economy and from many areas (ethnic cleansing). In the case of the EU, the Moslem immigrants are virulently anti-Semitic, which exacerbates Europe’s long-standing anti-semitism. This should lead to the emigration of Europe’s remaining Jews, with the predictable damage to European culture and science. More importantly, the immigrants are not interested in, have no commitment to will not maintain the existing First World political arrangements (NATO, IMF, WTO, UN, etc) that were created by the US and Europe. The existing world order is bound to change, and its main institutions will become much weaker and ineffective, perhaps even disappear (most likely NATO). This will exacerbate the ongoing decline in international stability and cooperation and lead to ever more adventurism by regional powers. Yes, these are important points. Thanks for bringing them up. We at AFNL have examined many of those topics in other articles. A blog article such as the one above is necessarily limited in what it can support and document. It has to be short enough to at least skim quickly. We usually cover one topic at a time, and when we point out problems in one nation or one area, we are not saying that all other countries or aspects of the world are functioning to perfection. As contrarians we tend to write more about things which people try to keep us from writing about.